Kellogg Photography is attending the Macy's Bridal Show at Polaris on March 30th. If you are in the area we welcome you to visit the free bridal show. You will be able to meet with me and view our collection of wonderful wedding albums and proof books. 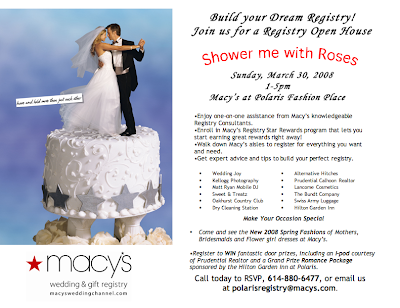 The Macy's Bridal Show starts at 1pm and last until 5pm on the 30th of March. We hope to see you there.